I’ve always admired sink skirts. 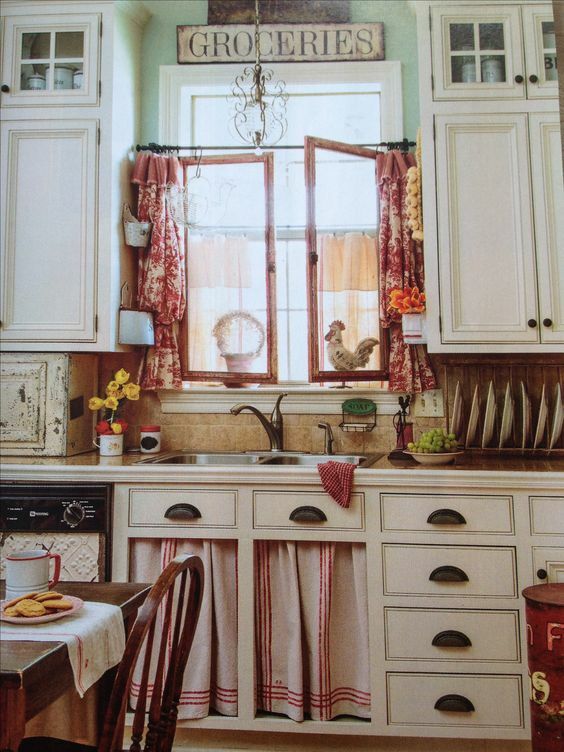 I like the way they soften the hard edges of all the cabinetry and provide an opportunity to add a pop of color to the kitchen. 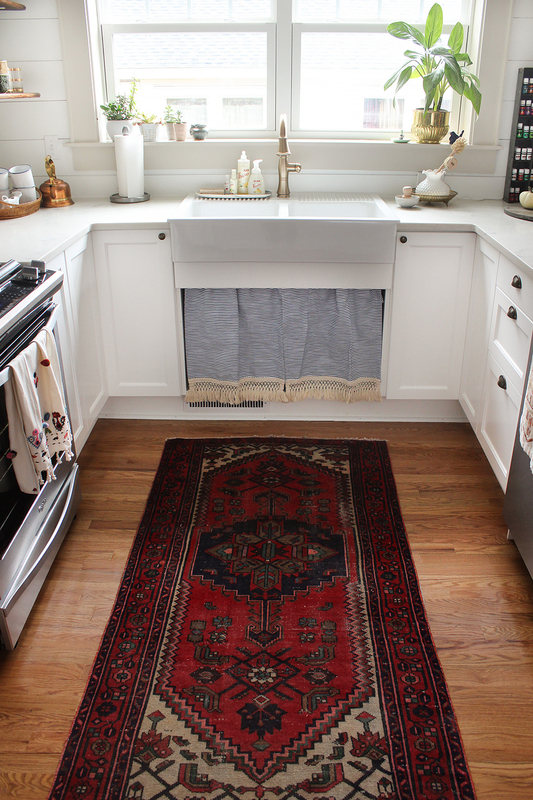 Depending on the style and fabric, a sink skirt can work in almost any kitchen – from country to traditional to modern-rustic. 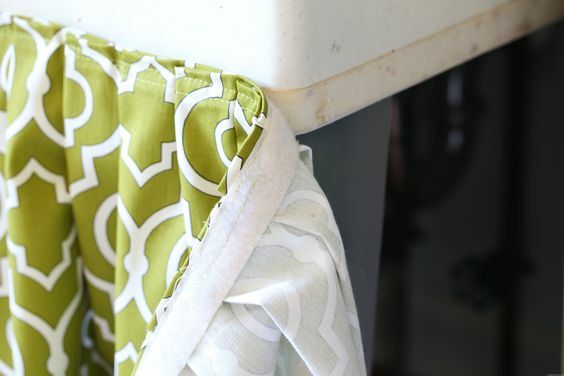 And making a sink skirt can be as simple as a tension rod and a couple of dish towels (no sewing required!) or a custom sewn skirt detailed with pinch pleats. 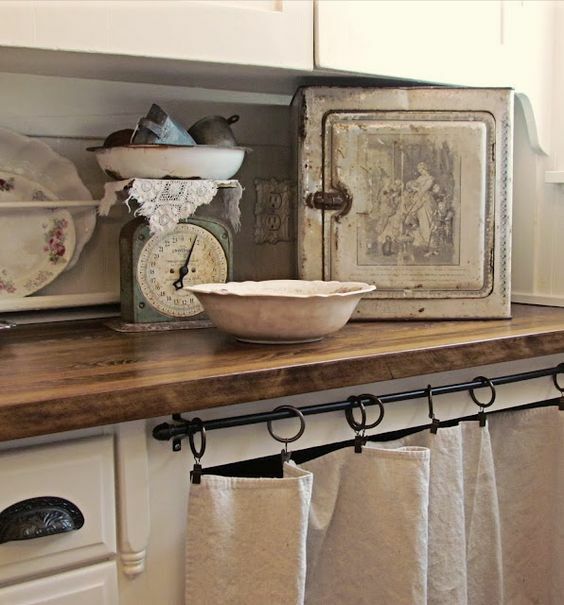 Also, you don’t need a farmhouse sink for a skirt! This one is from Lindsay at the The White Buffalo Styling Company. She used two dish towels that she safety pinned to a tension rod. No sewing required! The board across the front was added to hide the tension rod and safety pins. This one has pinch pleats which gives it a little more formal look. 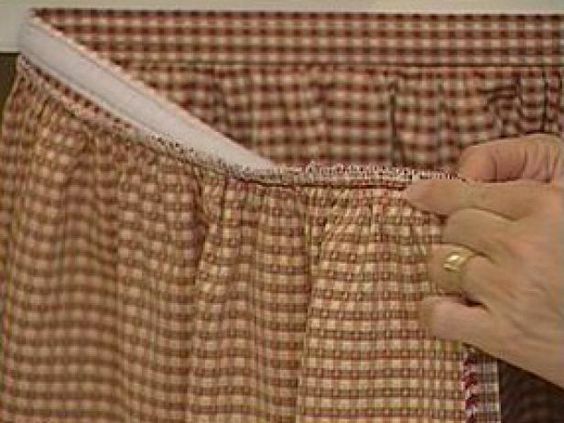 In the following two examples, the skirt is shirred on the rod. There’s a pocket for the curtain rod across the top of the fabric. To get the gathered effect a good rule of thumb is the fabric needs to be 2 1/2 times the width of the opening. Here’s an example where there is a middle vertical board between the under sink cabinets. In this situation the tension rod can go just inside the cabinet or a curtain rod can be mounted on the outside of the cabinet frame. 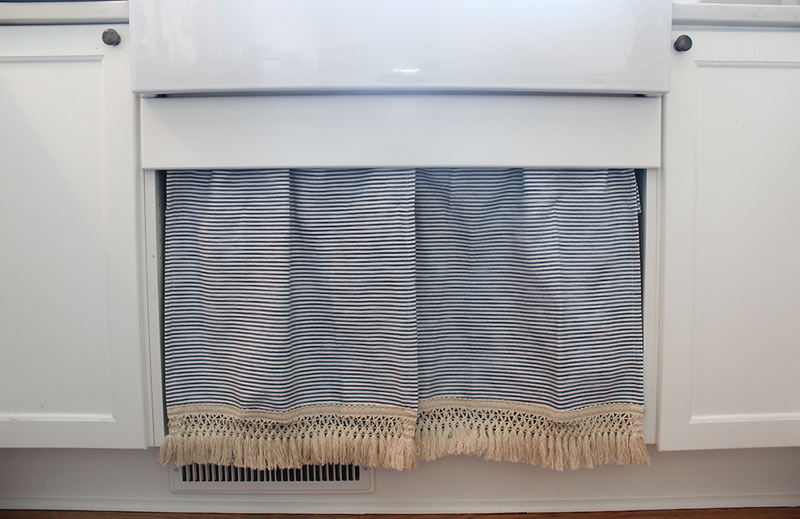 Keep in mind that the curtain won’t slide if you are using velcro but that may not be a big deal. I’ve seen the velcro application used on utility sinks and also freestanding bathroom sinks. 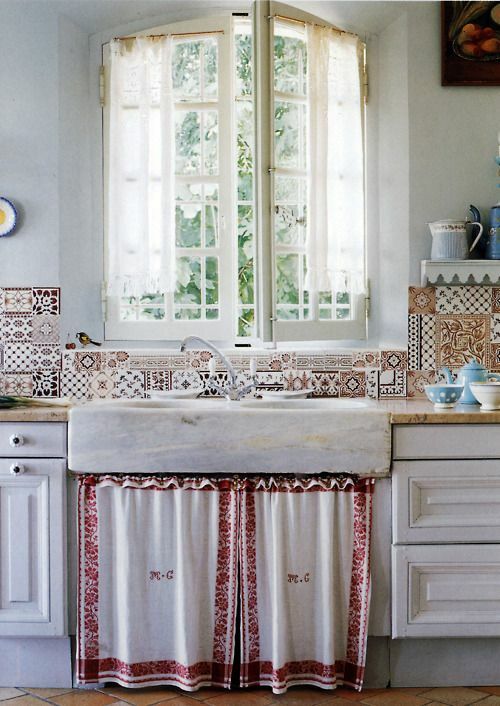 These are some of the images I pinned while I was figuring out fabric and style for my kitchen sink. Ultimately I decided on making a pinch pleated version hung from a tension rod, using a large green and white buffalo check fabric. 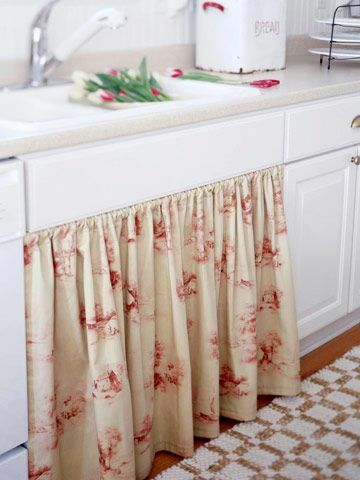 If I’ve piqued your interest in making a sink skirt, here’s what you can do now to see if you’ll like it: Simply open your cabinet doors and lay a curtain rod across them, draped with dish towels, a window curtain or a piece of fabric. 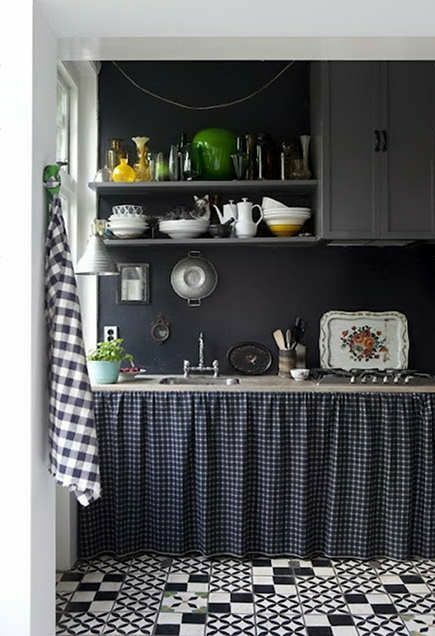 Stand back and see how it feels within the context of the rest of your kitchen. Walk away and then come back and look at it again. Sometimes it has to “settle in” before you can really decide. Stay tuned for Part II where I will give step by step instructions for making a pinch pleated version like mine! Previous Mad for Plaid Furniture Flips!